Tectonic Pate » Just don’t Tweet and drive, alright? Just don’t Tweet and drive, alright? Mark Graham makes awesome maps comparing the real world to the virtual, and his latest – geotagged Tweets in major African cities – is another masterwork. It’s really interesting to compare the differences in social media use between, say, Cape Town and Addis Ababa. 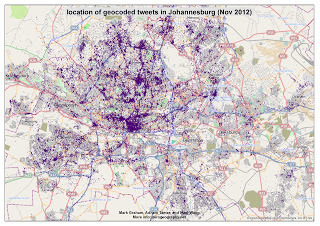 If you know the cities even passingly well there’s some other stuff they suggest too – in Johannesburg, Sowetans seem to be more prolific Tweeters than those who live in Boksburg (a big Afrikaans community).